Moreover, chances extracting images without malignant findings and microcysts have increased with an increase in the accuracy of mammary ultrasonographic screening., However, core needle biopsy (CNB) is frequently inapplicable to small breast ductal dilatation and cystic lesions. Even if CNB can be performed, it is difficult to make a judgment due to an insufficient amount of the specimen, and a definite diagnosis cannot be made in many cases. Therefore, FNAC is an essential examination for these lesions, and improvement of the judgment accuracy of FNAC, standardized techniques, and report of liquid-based cytology are necessary.,, The objective of this study was to set an optimum cut-off value to distinguish between benignity and malignancy and identify findings useful to judge breast cancer by applying a cytological scoring method, aiming at improvement of the cytological accuracy of these lesions. This study was approved by the Hirosaki University School of Medicine and Hospital Ethics Committee (2015-033). This study provides retrospective analysis. The study involved 23 (2.1%) of 1076 cases examined by breast FNAC between August 2008 and October 2013 who were suspected with intraductal lesions or cystic change by imaging diagnosis and foamy cells in the background of cytology. These cases were definitely diagnosed histopathologically by surgery or needle biopsy. Twelve cases were benign on mammary gland FNAC, and the disease was mastopathy in nine and intraductal papilloma in three. Eleven cases were malignant on FNAC, and the disease was ductal carcinoma in situ in eight and invasive ductal carcinoma in three. After fine needle aspiration, all samples were sprayed on slide glasses and pressed, and the preparations were rapidly fixed in 95% ethanol and subjected to routine Papanicolaou staining. First, 4–27 typical cytology images were acquired in each case. The magnification of the objective lens was set at 4, 10, and 40 times, and images of each cell cluster were acquired at each magnification. All images of each case were scored by four raters with experience (2–30 years) in cytology. The following 10 items were scored 1–3, and a high grade was scored high. The total score of the items was within a range of 10–30. Cluster atypia was evaluated in three items: 1, scattered epithelial cells; 2, uneven irregular cluster edge; and 3, irregular nuclear overlapping. Cellular atypia was evaluated in seven items: 4, irregularity of the nuclear size; 5, nuclear morphological irregularity; 6, deep dyeing chromatin; 7, chromatin granularity; 8, chromatin distribution; 9, large nucleoli; and 10, absence of myoepithelial cells. Myoepithelial cells were scored as follows: The presence of bare bipolar or round nuclei in the background with the presence of myoepithelial cells in the cluster was scored 1, the presence in either background or cluster was scored 2, and the absence in both background and cluster was scored 3. The scores were input into an original scoring template prepared using Excel, and the mean of scores judged by the four members was calculated. To maintain the accuracy of scoring evaluation, images were judged by comparison with the standard images of the nine items of the scoring criteria [Figure 1]. The absent standard score 2 image was presented as midpoint between scores 1 and 3. The total score of each disease, the median, and quartile ranges [value of the first quartile, Q1; value of the third quartile, Q3; interquartile range (IQR)] of the total 12 benign cases (190 images analyzed) and 11 malignant cases (237 images analyzed) were determined. To determine the optimum cut-off score to differentiate between the benign and malignant cases, the receiver operating characteristic (ROC) curves were drawn by ROC analysis, and the value with the highest “sensitivity-(1-specificity)” and the area under the ROC curve (AUC) were determined. AUC is an index to evaluate the usefulness of the ROC curve numerically, and the value ranges were from 0.5 to 1.0. The usefulness of the ROC curve increases as the AUC value comes close to 1, and the accuracy of AUC is evaluated as follows: 0.9–1.0 high accuracy, 0.7–0.9 moderate accuracy, and 0.5–0.7 low accuracy. In addition, the sensitivity, specificity, and diagnostic accuracy of the optimum cut-off value to differentiate between the benign and malignant cases were analyzed. The score was compared between the benign and malignant cases by the scoring items. In statistical analysis, since the distribution showed non-normality on a normality test in both diseases (Shapiro–Wilk test), Mann–Whitney U-test was performed, and all items showing a significant difference were subjected to ROC analysis as described in the section “Materials and Methods” 3 and the optimum cut-off score for differentiation between the benign and malignant cases was determined, and the sensitivity, specificity, and accuracy were investigated. The breast cancer cytology findings were investigated with regard to the correlation among the scoring items, aiming at identifying the combination of the items likely to develop simultaneously and clarifying whether these items are positively or negatively correlated in the benign and malignant cases. The correlations among the scoring items were investigated using Spearman's rank correlation separately in the benign and malignant cases. The correlation coefficient was compared and the scoring items with a characteristically high correlation coefficient (rs > 0.8) were extracted. The software used for ROC analysis in Methods 3 and 4 was Excel 2012 for Windows. SPSS 16.0 Japanese for Windows was used for the normality test (Shapiro–Wilk test), test of significant differences (Mann–Whitney U-test), and Spearman's rank correlation performed in Methods 3, 4, and 5. A P value of less than 0.05 was considered as statistically significant. All P values used were two-tailed. The scores [median (Q1, Q3), IQR] of the diseases are shown in [Table 1]. The scores [median (Q1, Q3), IQR] of the benign cases (190 images of 12 cases) and malignant cases (237 images of 11 cases) were 18.0 [(17.1, 18.9), 1.8] and 23.0 [(21.8, 24.1), 2.3], respectively. The results of ROC analysis are shown in [Figure 2]. 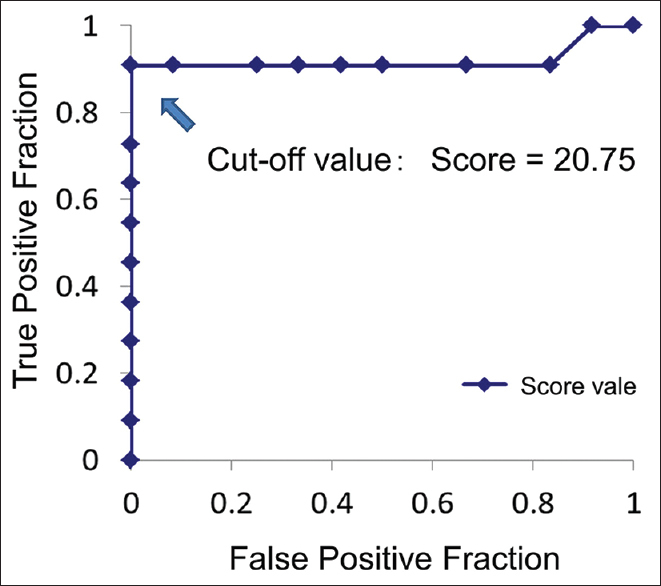 The optimum cut-off score to distinguish the benign and malignant cases was 20.75 (P < 0.01). AUC of this cut-off score was 0.93, showing a high accuracy, and the sensitivity, specificity, and diagnostic accuracy were 90.9, 100%, and 95.7%, respectively, clarifying that the lesion can be judged as malignant at a high accuracy when the score is 20.75 or higher. The scores of the scoring items [median (IQR)] of the benign and malignant cases and the cut-off score of each item to differentiate between the benign and malignant cases and their sensitivity, specificity, and accuracy are shown in [Table 2]. Of the cluster atypia items, the following items were useful to judge breast cancer: 1, scattered epithelial cells; 2, uneven irregular cluster edge; and 3, irregular nuclear overlapping. The cellular atypia items useful to judge breast cancer were as follows: 8, chromatin distribution and 10, absence of myoepithelial cells. Of these characteristics, the sensitivity of the following items was high (80% or higher): 2, uneven irregular cluster edge; 3, irregular nuclear overlapping; 7, chromatin granularity; and 10, absence of myoepithelial cells. The specificity of the following findings was high (80% or higher): 1, scattered epithelial cells; 3, irregular nuclear overlapping; 8, chromatin distribution; and 9, large nucleoli. The results of correlation among the 10 scoring items in the benign cases are shown in [Table 3], and those in the malignant cases are shown in [Table 4]. The correlation was moderate or stronger in the findings shown in bold. In the benign cases, no strong correlation was noted in any combination of the items. In the malignant cases, the following correlations were observed: (1) 1, scattered epithelial cells, became marked as 2; uneven irregular cluster edge became marked (rs = 0.8), (2) 4, irregularity of the nuclear size became marked as 5; nuclear morphological irregularity became marked (rs = 0.6), (3) 8, chromatin distribution became marked as 9; large nucleoli marked (rs = 0.6), and (4) 6, deep dyeing chromatin became marked as 7; chromatin granularity marked (rs = 0.5). 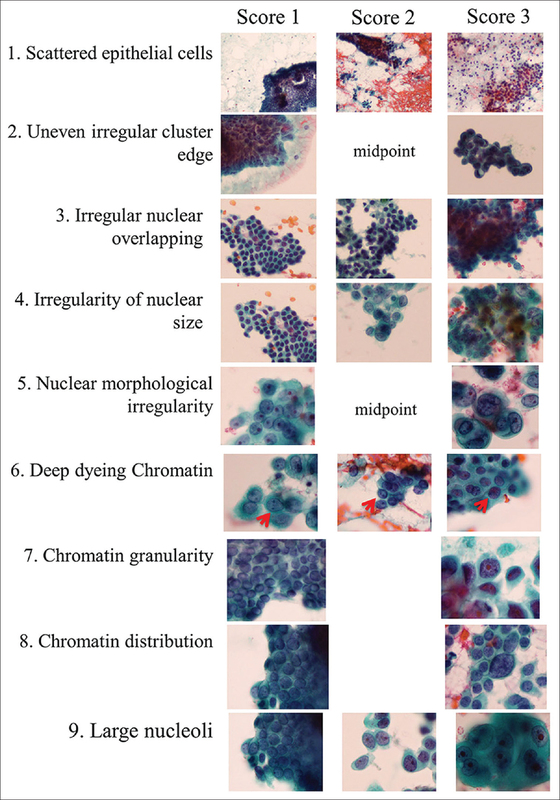 Several studies on cytological scoring as a breast FNAC evaluation method have been reported,,,,,,,,, and Robinson grading, has been widely used in studies on a grading system comprising six items of nuclear findings. Robinson et al., set the following six items as the criteria for nuclear atypia classification: “Cell dissociation,” “Nuclear size,” “Cell uniformity,” “Nucleoli,” “Nuclear margin,” and “Chromatin pattern.” The results of cell scoring using the Robinson grading were compared with those of the histological-diagnostic grading method (Bloom–Richardson histopathological grading,,,,) and Mouriquand's grading method in recent studies. These studies reported that Robinson grading is a useful method reflecting the prognosis and evaluating malignancy. In addition, a study on scoring a total of 12 items has been reported in which six items, “Overlapping pattern of the cells,” “Presence of necrosis,” “Presence of mucin,” “Appearance of myoepithelial cells,” “Appearance of bipolar bare nuclei,” and “Appearance of foam cell,” were added to the six items of Robinson grading. Our scoring system was different in that it comprised the following 10 scoring items: 3 items of cluster atypia, “1: Scattered epithelial cells,” “2: Uneven irregular cluster edge,” and “3: Irregular nuclear overlapping, “and 7 scoring items of cellular atypia, “4: Irregularity of nuclear size,” “5: Nuclear morphological irregularity,” “6: Deep dyeing chromatin,” “7: Chromatin granularity,” “8: Chromatin distribution,” “9: large nucleoli,” and “10: Absence of myoepithelial cells.” The characteristic of this study was the addition of the three findings related to cluster structure: “1: Scattered epithelial cells,” “2: Uneven irregular cluster edge,” and “3: Irregular nuclear overlapping.” No previous scoring method has closely evaluated atypia of the cluster structure. In addition, no previous study has investigated the chromatin by scoring three items: “6: Deep dyeing Chromatin,” “7: Chromatin granularity,” and “8: Chromatin distribution,” through which the nuclear findings could be closely evaluated. It was clarified that in the present scoring system, the lesion can be judged as malignant at a high accuracy when the cut-off score is 20.75 or higher (accuracy: 95.7%, sensitivity: 90.9%, specificity: 100%). Regarding the characteristics of scoring in breast cancer, the scores of the following five items were significantly higher than those in the noncancer cases “1, Scattered epithelial cells,” “2, Uneven irregular cluster edge,” and “3, Irregular nuclear overlapping” of the items of cluster atypia and “8, Chromatin distribution” and “10, Absence of myoepithelial cells” of the cellular items. The sensitivity was especially high (80% or higher) in the following items: “2, Uneven irregular cluster edge,” “3, Irregular nuclear overlapping,” “7, Chromatin granularity,” and “10, Absence of myoepithelial cells.” The specificity was high (80% or higher) in the following items: “1, Scattered epithelial cells,” “3, Irregular nuclear overlapping,” “8, Chromatin distribution,” and “9, Large nucleoli.” Ryu et al. reported that the scores of the breast cancer items: “Nuclear margin,” “Pattern of Chromatin,” “Overlapping pattern of the cells,” and “Appearance of myoepithelial cell” were significantly high, being consistent with the findings of this study. Furthermore, it has been reported that evaluation by simultaneously scoring the grades of nuclear atypia and structural atypia of clusters representing histological atypia is important because the grade of histological atypia is II or III despite nuclear atypia being I in some cases.,, Therefore, simultaneous scoring of the cluster structure reflecting histological atypia and the grade of cellular atypia was the characteristic of this novel highly accurate scoring method. The characteristics of the breast cancer cytology findings were investigated with regard to the correlation among the scoring items. The items likely to simultaneously develop in the same preparation were identified based on the correlation among the scoring items, suggesting that evaluation of differences in the correlation among the scoring items between benign and malignant cases serves as an important index of their differentiation. No previous study investigated scoring evaluation of breast FNAC from this viewpoint.,,,,,,,, No correlation was noted in the benign cases in the following findings, whereas they appeared with significant correlation in the malignant cases: (1) 1, scattered epithelial cells became marked as 2; uneven irregular cluster edge became marked (rs = 0.8), (2) 4, irregularity of the nuclear size became marked as 5; nuclear morphological irregularity became marked (rs = 0.6), (3) 8, chromatin distribution became marked as 9; large nucleoli marked (rs = 0.6), and (4) 6, deep dyeing chromatin became marked as 7; chromatin granularity marked (rs = 0.5). These were novel findings for judging cancer by scoring evaluation of the breast. The breast FNAC scoring method is a useful technique to differentiate benign from malignancy of breast lesions accompanied by breast ductal dilation and cystic lesions and to identify the useful findings for judging cells. The authors are grateful to Mr. Masahiro Ishiyama of Department of Clinical Laboratory Hirosaki Municipal Hospital, for technical advice of cytology. This study was supported by a grant from Hirosaki Municipal Hospital Research (2008–2013). Center for Cancer Control and Information Services, National Cancer Center, Summary of latest cancer statistics in Japan. Available from: http://ganjoho.jp/reg_stat/statistics/stat/summary.html. [Last accessed 2017 Apr 12]. Sauer T, Lømo J, Garred Ø, Næss O. Cytologic features of ductal carcinoma in situ in fine-needle aspiration of the breast mirror the histopathologic growth pattern heterogeneity and grading. Cancer Cytopathol 2005;105:21-7. Altinay S, Ersöz S, Üye Y, Özdemir F. Mucocele like tumour of the breast associated with ductal carcinoma in situ and focal ductal carcinoma: What is the best approach to these patients? JCDR 2016;10:ED16-8. Gong Y. Breast and gynecological cancers. In: Shetty MK, editor. Breast Cancer: Pathology, Cytology, and Core Needle Biopsy Methods for Diagnosis, 1st ed.. New York: Springer; 2013. p. 19-37. Yamada S, Nabehima A, Nagata Y, Tasaki T, Noguchi H, Kitada S, et al. Pleomorphic carcinoma of the breast associated with cyst formation: A unique surgical case focusing on cytological and immunehistochemical findings. Cystic breast PC. Diagn Pathol 2013;8:75. Shilpi M, Ansari FA, Bahadur S, Katyal A, Narula A, Nargotra N, et al. Sclerosing polycystic adenosis: A rare tumor misdiagnosed as retention cyst on fine needle aspiration cytology. Diagn Cytopathol 2017;1-5. Berg WA, Sechtin AG, Marques H, Zhang Z. Cystic breast masses and the ACRIN 6666 experience. Radiol Clin North Am 2010;48:931-87. Cancelo MJ, Martin M, Mendora N. Preoperative diagnosis of a breast hydatid cyst using fine-needle aspiration cytology: A case report and review of the literature. J Med Case Rep 2012;6:293. Field AS, Schmitt F, Vielh P. IAC standardized reporting of breast fine-needle aspiration biopsy cytology. Acta Cytol 2017;61:3-6. Joseph L, Edwards JM, Nicholson CM, Pitt MA, Howat AJ. An audit of the accuracy of fine needle aspiration using a liquid-based cytology system in the setting of a rapid access breast clinic. Cytopathology 2002;13:343-49. Gerhard R, Fernand CS. Liquid-based cytology in fine-needle aspiration breast lesions: A review. Acta Cytol 2014;58:533-42. Robinson IA, McKee G. Cytological grading of breast carcinoma. Acta Cytol 1995;39:1257. Robinson IA, Mckee G, Nicholson A, D'Arcy J, Lackson PA, Cook MG, et al. Prognostic value of cytological grading of fine- needle aspirates from breast carcinomas. Lancet 1994;343:947-9. Khan N, Afroz N, Rana F, Khan MA. Role of cytologic grading in prognostication of invasive breast carcinoma. J Cytol 2009;26:65-8. Sood N, Nigam JS, Yadav P, Rewri S, Sharma A, Omhare A, et al. Comparative study of cytomorphological Robinson's grading for breast carcinoma with modified Bloom-Richardson histopathological grading. Patholog Res Int 2013;2013:146542. Gore CR, Shirish SC, Aggarwal R, Vimal S, Deshpande AH. Robinson cytological grading of breast carcinoma of fine needle aspiration cytology – An overview. Int J Pharm Biol Sci 2013;3:564-70. Sinha SK, Sinha N, Bandyopadhyay R, Mondal SK. Robinson's cytological grading on aspirates of breast carcinoma: Correlation with Bloom Richardson's histological grading. J Cytol 2009;26:140-3. Phukan JP, Sinha A, Deka JP. Cytological grading of breast carcinoma on fine needle aspirates and its relation with histological grading. South Asian J Cancer 2015;4:32-4. Ryu A, Takenaka A, Nagata S, Tomita Y. Scoring system of fine needle aspiration cytology samples for the detection of non-high-grade ductal breast carcinoma. Oncocytol J 2013;3:1-7.